In the olden days we had turkey necks and pencil neck geeks. Having a smartphone neck not only looks bad, it leads to chronic neck pain and headaches. You may may think the above is “no big deal” – but I assure you, your head and your life is falling off a cliff if you have a smartphone neck. also lead to improved overall fitness. Make sure you enroll NOW to reverse the flow of vital energy and power that’s been leaking out of your body instead of into your brain. Our family has a little black dog who weighs about 13 pounds. He’s the friendliest dog you can imagine – and used to prove it by jumping on everyone who visits. To control himself, the dog came up with a plan: when he goes to the door to greet you, he bites onto a slipper or sandal and runs around you until you acknowledge his presence. In this way he doesn’t upset the visitor or get admonished. As a dog’s friend, you come to realize how often the canine will stretch its limbs. The dog has only one stretch – but that’s all it needs because it’s a powerful stretch. This dog or cat’s stretch is not for the muscles, though, even though the muscles do get stretched. Primarily, an animal’s stretch is for strengthening and stretching the tendons and ligaments. The dog or cat’s stretch is not designed to build big, bulky and tight muscles. It’s designed for functional strength and flexibility. It’s designed to give the animal running and jumping speed, agility and power – as well as to maintain a connection to the center. A baby is similar, until he or she loses what came naturally, and that doesn’t take long. But a dog (or cat) never loses its center, never loses its core connection. would the animal remain as connected? The next question: Can a human being regain his or her connection to the center, to the core, to the trunk of the body? Yes, and the way to do so is through exercises that stretch and strengthen the tendons and ligaments of the body. I’m going to be putting many of these exercises up on the FureyFaithful.com membership site in the near future, so you can learn and practice them each day. Once you begin doing them, chances are you’ll do the same as the dog and cat. You’ll make sure you do them every single day. You wouldn’t feel normal or natural without them. Do they take a long time to do? Each stretch take about as long as a dog or cat takes to stretch, which last time I checked, was a few to several seconds. For now, you can do some Hindu Pushups from my best-seller, Combat Conditioning, to get the idea of the dog and cat. 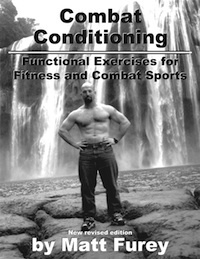 Combat Conditioning, as well as many of my other books, are available for an immediate down load when you become a member of the FureyFaithful.com site. That’s all for today, my friend. Remember to stretch before you leap. Last week I met with Frederic, a local pastor, whom I’ve been coaching, who has dropped well over 100 pounds. Frederic’s now down to 282 pounds after being at an all-time high of 420+ (estimated) el-bees. You may wonder why I used the word estimated in parenthesis. It’s because Frederic stepped on a scale that nearly broke at 400, and he figured, based upon sound effects and how much weight had to fall off for him to reach 399, that he must have been 420-440 smackers. I currently coach three men who were once Leviathan – with a capital L.
Now they’re happier and healthier than ever and they radiate power and confidence in every step. All of these gents follow the programs I teach on the Furey Faithful Member’s Site. They also religiously follow a food program I call… The Horrendous Diet. As I tell them, if other people who are not so slim themselves, tell you that your diet is HORRENDOUS ..
then you’re probably on the correct path. Or, if the person scolding you has never been more than 5-15 pounds overweight in his or her life – then this person is disqualified from giving you guidance as well. The Good News for Frederic, other than the pounds dropped, is the fact that his blood sugar is now stable, for the first time in YEARS. You can view Frederic’s testimonial on the Furey Faithful homepage. He’s not at his target weight YET – but he’s enjoying the JOURNEY – and it shows in the positivity he EXUDES. Instead of expecting happiness to come AFTER reaching a goal – Frederic understands what I preach. Happiness is enjoyed on the way to the goal – ALL ALONG the WAY. Last weekend I was working with, G, a young man who currently weighs 316 pounds. If you think that means he’s BIG – you are correct – but there’s MORE to the STORY.What more? Well, how about the fact that G used to tip the meat packing scales at 477 big ones – and how he used to feel awful going to a clothing store to get fitted. “People are getting bigger and bigger everywhere we go. The days of needing to drop 20 or 30 pounds are almost over. When I hear someone say he needs to drop 20 pounds, I can’t help but think to myself, ‘Dude, that’s nothing. Put a number one in front of the 20 and I can relate. Nowadays, there are tons of people needing to drop 100 pounds or more.? I’m currently working with three people who have already dropped at least 100 pounds. in how they balance hormones, naturally. All my success stories in weight loss – who keep it off – are following The Horrendous Diet. In short, if you’re NOT hearing someone exclaim, “Oh my GAWD, your diet is horrendous,” then you’ll probably find comfort, solace and most of all, RESULTS, when you eat the Furey Faithful way. Need to drop 20 to 200 pounds – then become a superhuman member of the Furey Faithful today. First time I saw him, he’s big as a killer whale. Or how much he loved to drink beer and slam jelly. Yo, Furey-cat, here’s someone you gotta see. I recognized the voice, but the body skipped town. Did you fight a silverback at the Orlando zoo? Haha, Fureycat, you’re always so charming. Can’t you tell, I’ve been eating different farming? But there’s no way in hell you didn’t move your rear end. Right on, per usual, you’re definitely above smoking pot. I gave up beer and starches, then did hundreds of Hindu squats. of the Furey Faithful group, from now through December. I’m betting your story will do most of the selling. Just promise me now you’ll spare the old adage. Helping your members will be a great thrill. they can truly expect to lose their unwanted fat. The first time you saw me – you saw a big whale. Now, I’m so grateful – when you see me as … Dale. *The above poem written by Ma Tai – the alter ego of Matt Furey, best-selling author of Combat Conditioning and many other books on fitness, martial arts and self-image psychology. Enroll in the Furey Faithful and follow the truly life-changing system that is working for Dale and so many others. We are now less than ten days away from The Undiscovered Secrets Seminar – an event wherein Ted Nicholas and myself will be teaching you how to be FAR more than a best-selling author and a professional human being. We’re going to teach you longevity secrets, for body, mind and book. Think of it: Everyone who is honest wants to be remembered, wants to be significant and important. Being an author fulfills all of the above. Plus it gives you an opportunity to travel the world, to go where others don’t dare. With less than ten days to go, I’ve come across a novel way to move a fortunate few into this sensational seminar. For years people have asked if I have “scholarships” to any of my events. But this year I’ve had a change of heart as I’ve discovered a way to offer this seminar to those who are not yet enrolled. I only have a few scholarships to give out – so you’re going to need to act immediately. If you really want to attend this seminar, write my office directly by replying to this email, and tell me the best true tale you can, i.e. your story, and why you deserve a scholarship to this event. Currently I have some partial scholarships to award – and one FULL RIDE. And by the way, if you write me in cursive, scan your letter and email it to me, this will carry more weight than a typed email or a letter that was written in print. You may find this strange, yet this is one of the “big reveals” to be uncovered at The Undiscovered Secrets Seminar. Jump on this now, my friend. I will be rendering my decisions on scholarships later this week. Such is the command of a UFC referee to start a fight. Sprinting out of your bed may get you injured, or worse. There’s a much safer procedure and one that is guaranteed to get you going every single day, even when you didn’t get a good night’s sleep. I use it every morning at 5:55 or sooner. I used it last week while in Las Vegas. We flew in, got to bed late, and I was still up at my regularly scheduled time, even with the three-hour time change. After we flew home, I was up until 2:20 a.m. – and I still catapulted out of bed before the bell tolled six. Once I’m outside I sense some resistance to doing my workout. I most certainly do. But I keep going because of how I’ve learned to communicate with my brain. My brain is there to serve me. I instruct it what to do – not the other way around. If your brain wins the battle, you’re a slave to it. If you win the battle, your brain is your faithful servant. Remember this. My workouts are never excursions with tee-vee or head phones to listen to music. I recommend what the greatest thinkers and philosophers who ever lived did. They walked so they could think more clearly; they walked to meditate, to create and to solve problems. Walking isn’t all they did either – and neither is it my only training – but it IS fundamental to being human. If you don’t walk your life will not have as much flow. But how to get yourself going and keep yourself going in the morning, especially when you have good excuses for getting more sleep. Number one, you believe in a daily discipline that you do without let-up, or else..
You flog yourself in some way. Number two, you give yourself a reward for following your discipline and you have a punishment if you don’t. By flogging I don’t mean you hurt yourself, You simply refuse to reward yourself – and that’s usually all it takes. No coffee for you today, buddy, you didn’t train. There are other tricks I use to keep inspiration levels high, even when you’re drowsy. 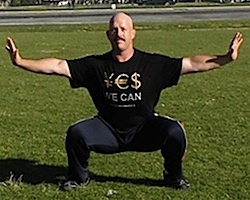 I also employ a wide variety of qi gong walking techniques – and just one of them, as my brother found, when combined with a diet the average know-it-all will consider “horrendous” has helped him successfully drop 50 pounds in 90 days at age 60. You’ll learn all about these exercises and the “horrendous” dietary advice I gave him – when you’re a member of the Furey Faithful. Come join me and the others all over this “whirld” who are living the dream. IMPORTANT: As you browse the FureyFaithful homepage you’ll readily notice that “there are no testimonials from women” (I don’t call them “females” as that’s a classification for animals, not humans). Anyway, some women are a bit peeved at me, demanding an explanation. “Hopefully this isn’t some misogynistic, he-man woman-hating society, is it?” one writer opined. My answer: Men who give me testimonials are generally not stalked or persued by whack-jobs. Many of the women who’ve learned from me are verifiably gorgeous and incredibly fit. As a consequence, with photos, names and approximate local published, some goons have may harass them, and I’m not in favor of such a situation. So I’ve chosen to only publish men’s testimonials on my page as I will not fictionalize names, stories and so on. I’m so proud of my brother. At 60 years of age he’s dropped 50 pounds, and he’s accomplished the feat in 90 days. Now, before you say, hold on, that’s toooooo fast, let me provide a counter punch. The key to sustaining your ideal weight is not whether you lose the weight quickly or slowly. It has more to do with staying with the program AFTER the weight is off. Additionally, once the weight is off, you need another Everest to climb. You set another goal and get to work on it. This keeps you perpetually inspired, it gives you deep enthusiasm and passion for each new day. I’d love to help you achieve the fitness goals you have in mind for this year. It would be a great honor to see you absorbing the information I’ve taught my brother. Naturally, you don’t live near me and don’t have access on a personal level – yet I believe you’ll create the same type of results with my Furey Faithful Member’s Site. There’s literally a vault of information contained within the confines – and you can get started immediately, as all the information is delivered digitally. This means all the books, special reports, videos and audio files. It may be too much for you. It may be so much information that you’re left feeling that I should’ve charged you a lot more. And I would unhesitatingly agree with you. Then again, it’s my objective to reach you and bring you to the top of the mountain, no matter where you live in this wonderful world we get to share. Enroll NOW while the fee is still ridiculously low. Come on in – and train with me. You’ll be ecstatic you did. If you’ve already written out a list of goals or New Year’s Resolutions for the year, there’s still time to make an adjustment that’ll make a HUGE contribution in your journey toward self-actualization. Inhale through your nose while imagining your entire body as a set of lungs. Pull the inhale all the way down to your feet. Now exhale through your mouth, letting this inhale out with effortless ease. Repeat the above three times. Now that your mind is clearer and you’re more relaxed, let’s start the New Year off with a BANG. Contrary to what many erroneously believe, starting the year with gusto is NOT done by writing out goals or resolutions, at least not if you want to create a surge of unstoppable momentum. This is why I say the first order of business is to recall and review, and do so with a pen in hand and several sheets of paper before you. What do you recall and review? You recall what you’re grateful and thankful for about the preceding year (or years). Begin making a list of at least 10 events, experiences or things you’re grateful for about your life that took place last year. If you’re drawing a blank, then you’ve proven my point. You’re in no position to be starting the year off with goals or resolutions. This means if you have no gratitude you are also grossly deficient in enthusiasm. Be-cause gratitude is the fuel that puts your life into a state of mellifluous flow. Gratitude supercharges your emotional state and makes it relatively easy for you to imagine and feel positive possibilities manifesting in the future NOWS of your life. Still can’t come up with anything to be grateful for? If you were to have your sight, hearing or ability to taste removed, would you object? If so, you better consider these senses as something you’re grateful for. How about if you were to have your home, your vehicle(s), the clothes on your back or in your dresser or closet taken away? If so, either give them away or be grateful for having them. How about your ability to walk, talk and remember? Very good. Be grateful for them because there are plenty of people with dementia who, if they could still remember, would wish to have these skills back. I first arrived at the conclusions shared with you in this email while on board a plane back to the U.S. of A. A New Year was upon us, so I took out a pad to write my goals for the New Year. For some odd reason I couldn’t do so. Instead, I felt compelled to recall and review what was already good about my life. My list ended up covering well over 100 items and the mere act of putting this list on paper with a pen in hand created a surge of joy and euphoria that was unmistakable. In coaching calls with clients I began sharing this technique and the results were off the charts compared to starting the year with goals and/or resolutions. Everyone achieved far faster than ever before – and did so while maintaining a pleasant state of equanimity and harmony. Today, I’m sharing this wisdom with you and I sincerely believe you’ll be amazed at how good you will feel as your list gets longer and longer. Take a few days on this. Start NOW but continue to add to the list over the course of a few days. Reread the list each day. Form a mental image of each memory and play it for a few seconds. Then stand back and behold as the seas part and your life begins to move forward. At this positive feeling builds within you, you’re ready to craft some goals. I’ll be covering more on the subject of goals and how to achieve them in the near future. P.S. I’ll be covering an awe-inspiring A-Z on the above and much more at the seminar Ted Nicholas and I are having next month in Tampa. Make sure you’re part of this monumentally ganrgantuan positive life-changer. Currently you can enroll for 50% off the total amount, but as seats are snatched, the fee will go up. Enroll NOW and BE PART of something BIG. If you’re looking for motivation or inspiration to get more done in less time, consider going to bed a bit later – and/or getting up earlier than usual. Several months ago, I made a decision to get up earlier than usual and slide out the door to walk a minimum of three miles. This may appear to be an easy task, but I’m a “late to bed” moonlighting type of guy, so I’ve never practiced, believed in or advised others to get up at 5 AM or to go to bed early. Yes, I realize there are many successful people who swear that getting up early is the hallmark of their success. Similarly, I’m simultaneously aware of the masses who get up early each day and receive no tangible or verifiable benefits. Additionally, there are many legendary historical figures who worked creatively into the night – as well as innovators who discovered new pathways after midnight. As a practitioner of Chinese internal martial arts, and a student of Taoist teachings on health and longevity, I’m aware of how the grandmasters have taught for centuries that the power hours of each day are 11 PM – 1 AM and 11 AM – 1 PM. Think of the person taking a “power lunch” or the innovators and creators who were working after midnight to bring something new into existence. There may not be many of them, but I believe they enjoy a secret that few are aware of. Personally, many of my best products were either created or finished in the late-evening, early-morning hours, and to celebrate the accomplishment, I slept in. If you train for an hour – you get two hours of benefits. If you go for two hours – you get four. I realize that this structure doesn’t necessarily appeal to those who believe you should get up at 5 AM each day or that you must have eight or nine hours of sleep per day to be a peak performer – yet, I believe there are some definite similarities to the approach. 2. You’ll be less prone to interruptions and trivial matters that anyone with a third-grade education can handle. 3. You’ll gain psychological and spiritual benefits, in part because you feel a sense of achievement just from the realization that most people are in bed already. So, as you can probably see, if I’m going to be up until midnight or later, it’s inconceivable that I should also get up early to go for a jaunt. Yet, intuitively, I felt this was a shift I needed to and wanted to make. Upon contemplating the situation, I became aware that following this approach would result in a five or six-hour sleep pattern, rather than the eight or nine hours I was used to getting. I then thought of something novel and made a psycho-spiritual shift in how I used my imagination as well as how I was utilizing my frontal lobes, the part of the brain involved in planning, organization and the prioritization of one’s day. I put my ideas on paper in a hand-written journal I keep, then I set my timer to awaken at 5:55 AM, and made an agreement with myself to be out the door within 10 minutes. When morning came the rebellious side of me that was intent on hitting the snooze button was unbelievably incorrigible. What are you doing? Who do you think you are, Furecat? You don’t get up this early. This is absolutely stupid. Hit the snooze button and go back to sleep. This is crazy. You already walk five miles a day, you don’t need to do it at THIS HOUR. As I was about to hit the snooze button, an illuminating awarness flashed before me. I noted the precise mental picture I had just imaged. The go-back-to-bed voice I was hearing was mostly a mental image, a mental picture of myself snoozing. At that moment I crafted an idea to transform the image of myself snoozing to one of me getting up and going outdoors for a walk. This simple change in how I was using my imagination made it incredibly easy to follow through on my plans. As a result I’m now able to get even more done in less time – so much less that I now do something truly mind-blowing. I can cover this for you in a future dispatch if you’re game for it. Or you can apprise yourself of all the nitty-gritty details at my seminar in February. See it. Be it. Have it. P.S. I’m thinking that no one reading this email can picture himself or herself in some area of life wherein you’d love to make a change for the better and move to the next level. But then again, maybe you do want to get more done in less time. If so, enroll in the seminar I’m doing with the legendary Ted Nicholas this February in Tampa. It will transform your life in a way unimaginable in common hours.